It’s a blend of wool and misery. You spend your days tugging at the itchy collar of a thermal top, battling with the sweat-stained sleeves. This shirt sits bulkily beneath your clothes, refusing to wick away moisture and sticking unpleasantly against your back. You wince, feeling the fibres clench once again against your skin. It’s hot; it’s uncomfortable, and it’s in desperate need of a replacement. We suggest adding cheap men’s thermals to your winter wardrobe. Searching for all-day relief? Baselayers delivers cheap thermals for men - pairing quality fabrics with competitive prices. We believe that every customer deserves superior comfort, which is why we offer products that promote fashionable functionality. Take advantage of lightweight, breathable tops and leggings this season. Softness - our men’s cheap thermals boast ultra-fine designs. They’re crafted from 18.5-micron Merino wool, which promotes a smooth and seamless fit beneath all outerwear. Their fibres promise long-lasting softness. Breathability - when buying cheap men’s thermals, seek out breathability. Our options feature natural crimping elements, which help to promote air-flow and create a more comfortable fit. Moisture-Wicking - too often men’s thermals sold at cheap prices leave wearers feeling sticky, trapping every drop of sweat within their heavy fibres. Our tops and tees counter this through their moisture-wicking properties. They draw water away from the skin and efficiently regulate temperature (staying warm even while wet). Lightweight Constructions - experience flexible, lightweight designs with cheap men’s thermals. Our products layer easily beneath every tee, dress-shirt, and jacket. Their micron fibres follow the body’s movements, ensuring an unimpeded range of motion and sterling comfort. Through these benefits, men’s cheap thermals are ideal for every blustery day. No longer suffer through itchy, irritating fabrics. Let our Merino wools instead offer relief. You need men’s thermals for cheap prices. You also need speedy service, not wanting to waste another day with your aggravating innerwear. This is why we now offer express deliveries. After buying cheap men’s thermals, upgrade to our priority delivery option. Through this, you can quickly receive your long-sleeve tops, tanks, tee-shirts, long-johns, and more - with our team finding the fastest transportation options available and expediting every item. This ensures next-day servicing for most customers in Australia. It also ensures immediate access to cheap men’s thermals, with you able to replace your old winter wardrobe with sterling Merino options. Online: To request more information about men’s cheap thermals send us an online enquiry. We’ll gladly answer any questions or comments! 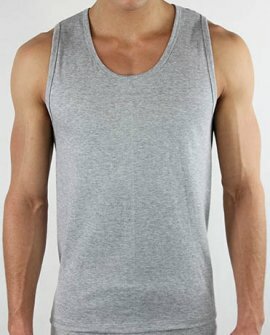 Please note: Only available in Medium and Large DJ5600 Men's Waffle Tank Product Description..